As with restorers of vintage radio equipment (as with Gary Steinhour's Heathkit DX-60B project), there are avid restorers of vintage computers (I'm working on retrofitting a Packard Bell pizza box desktop), vintage televisions, vintage kitchen appliances, and vintage tape recorders / players. In 1969 when this article appeared in Electronics World, magnetic tape was a big deal. Reel-to-reel was the domain of true audio aficionados - the most expensive type of equipment - while the rest of us settled for cassette and 8-track tapes. Cassette tape people generally regarded 8-trackers as audio Neanderthals, Philistines, bumpkins, non-sophisticates. I was - and still am - an 8-track guy. In fact, not that long ago I did a minor restoration of the Readers' Digest Model 800-XR stereo system that I bought originally in the mid 1970s while in high school. I have an 8-track tape splice / repair kit that is used to tend to my tapes as needed. Although 8-track tapes and players are larger than cassette players, I always liked the feature that, because the songs were spilt among 4 parallel tracks, you don't have to fast forward through as much of the tape to get to a specific song. No matter what audiophiles tell you, I submit that most people cannot tell the difference between a song recorded on a cassette tape or an 8-track tape... and don't buy into the line that adjacent tracks bled over into each other since only very poorly aligned heads will do that. How do the new cassette recorders stack up against reel-to-reel types? Here is a close look at one of the hottest items to hit the audio market. With its high degree of portability, simplicity of operation, and good over-all performance, the new cassette tape recorder is one of the hottest items to hit the home entertainment market in recent years. Most of these high-performing newcomers are equally at home as car tape units; portable recorders for taping staff meetings, conferences, and class lectures; or as compact tape decks to upgrade a home stereo console to include the versatility of tape. Over five years ago, the Philips Company of Holland pioneered in the development of a new concept in the recording field - a cartridge tape recorder as easy to load as a film-cartridge camera, yet offering all of the features of a conventional open-reel recorder. 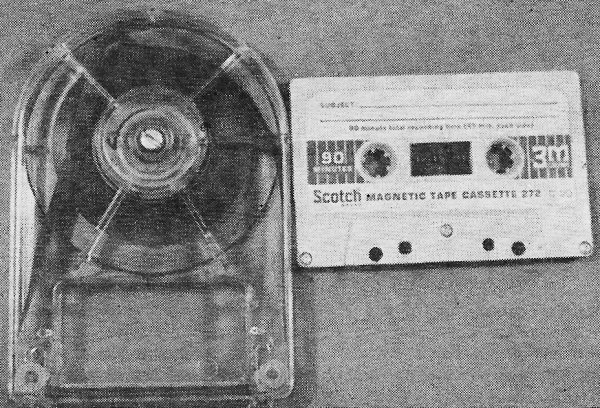 At the heart of this new recorder was a small tape cartridge containing two miniature plastic reels wound with 1/8-inch (actually 150-mil) magnetic tape and completely enclosed in a small plastic case - or cassette (Fig. 1). The tape operates at a slow speed of 1 7/8 in/s. Fig. 1. 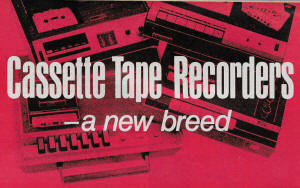 The cassette is a compact reel-to-reel cartridge using special thin 1/8-in (actually 150-mill) tape. The tape is pulled from one of the reels (acting as supply reel, past a tape-guide idler, then past pressure pad and tape head. 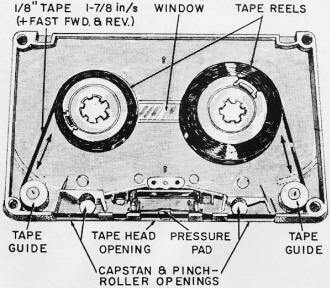 The tape then moves between the capstan and pinch roller on the tape deck, around the other tape-guide idler, and then to the other reel (acting as take-up). When the cassette is flipped over at the end of the tape, the capstan and pinch roller are in the other openings and the function of the reels is reversed. The first cassette recorder was marketed in the United States in 1964 under the Norelco "Carry-Corder" label. 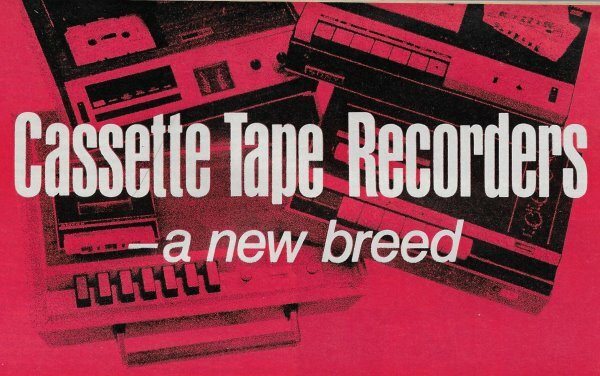 A short time later, an unusual licensing agreement was worked out to encourage other tape-recorder manufacturers to adopt the cassette design. In view of the tremendous reception accorded the cassette recorder, a number of companies rushed to obtain the right to market their own lines of cassette recorders. This explains the similarity among early makes and models. Today there are over 200 different models from more than fifty tape-recorder manufacturers. Included in this growing list of cassette manufacturers are such well-known names as Ampex, Norelco, Sony, Wollensak, Mercury, Panasonic, Aiwa, Crown, RCA, Concord, and G-E.
Perhaps the most significant result of Philips' generous licensing agreement was instant standardization. Today, all cassettes, both stereo and mono, are completely interchangeable and can be played back on any make or model of cassette recorder. The fact that both mono and stereo cassettes may be interchanged represents a major breakthrough in recorder technology. Recall that conventional four-track stereo tapes cannot be played on a mono recorder because of the location of the quarter-track head gaps in relation to the tape tracks. Since the quarter-track stereo recorder places two quarter tracks in the upper half of the tape, recorded in opposite directions, a mono half-track head picks up both upper tracks which results in a garbled output. The cassette quarter-track heads, on the other hand, record two tracks in the upper half of the tape, but both are recorded in the same direction and may be picked up equally well by either a cassette stereo or mono playback head (see Fig 2). A disassembled tape cassette is shown here. Outside dimensions of the cassette are 4 by 2 1/2 inches. Thickness is about 1/3 inch. Cassette tape cartridge is compared here with an endless-loop cartridge shown at left. The latter will operate in only one direction and it cannot be operated at high speeds. Cassette is compared with an ordinary 7-inch open reel of tape. The portable cassette recorder shown at right is not very much larger than the 7-inch reel of tape. All cassette cartridges are equipped with a unique safety feature which serves to prevent accidental erasure of a pre-recorded tape. This safety feature consists of two plastic tabs located along the rear edge of the cassette. Removal of the plastic tabs automatically activates a record safety interlock any time the cassette is placed into a cassette recorder. In order to re-record over a pre-recorded tape, simply place short lengths of adhesive tape over each of the two spaces left by the missing tabs. The cassette can then be erased and re-recorded just like an ordinary blank cassette. Blank cassette tapes are available in three basic lengths: 300 feet, 450 feet, and 600 feet. The 300-ft tape can record continuously for 30 minutes on each side for a total of 60 minutes. Likewise, the 450-ft cassette provides for 45 minutes of recording time per side, and the 600-ft cassette re­cords up to two full hours (one hour per side). Since all cassettes are interchangeable, they all look alike. However, some brands of tape cassettes employ a better system of internal lubrication, and a special low-noise tape formulation provides for improved recording performance at 1 7/8 in/s, especially for the higher frequencies. Therefore, in order to obtain consistently good-quality recordings, it is advisable to stick to one of the known brands of cassette tapes and avoid the bargain counter offerings. The four- and eight-track car-tape units are examples of endless-loop cartridges. In comparison to the cassette, the endless-loop cartridge system should have slightly better fidelity because of its higher tape speed (3 3/4 in/s compared to the cassette's speed of 1 7/8 in/s). However, this endless-loop design has a major drawback. It cannot be operated fast-forward or rewound but can only play in a forward direction at normal speed. The cassette, on the other hand, is constructed of two miniature reels which operate in the very same manner as a conventional open-reel recorder. Therefore, fast-forward and reverse are standard features on the cassette recorder. Other recent developments in favor of the cassette have been the development of better recording and playback heads along with the improvement in low-speed master-recording techniques. Both the Dolby and the Ampex EX+ processes have been quite successful in reducing surface and background noise for low-speed tape-recording systems. These processes are responsible for new lines of relatively high-quality pre-recorded musical tapes currently being marketed for the cassette recorder. The over-all acoustic response of most inexpensive portable cassette recorders ranges from about 200 to 7000 Hz. This limited response is due, in part, to the small speakers employed in the cassette's space-saving design. However, the full-size stereo systems have a much broader acoustic response extending from approximately 80 to 10,000 Hz. Even though the acoustic response of the portable line of cassette recorders is somewhat limited, their preamp fidelity is quite good. What is more, some of the new a.c.-operated stereo tape decks now available boast an electrical preamp output signal (that may be applied to your stereo system) that is within 2 dB from below 50 Hz to 12 kHz. Although the cassette's response is below the 15,000 Hz normally considered essential for high-fidelity reproduction of classical music, even a portable cassette machine does surprisingly well in recording and playing back music. To illustrate this point, the author recently arranged a tape demonstration involving a professional reel-to-reel recorder and one of the good-quality portable cassette recorders. A dub of the "1812 Overture" was made from the conventional recorder to the cassette and then each of the recorder's pre-amp outputs was wired into a professional-quality sound system by means of an audio switcher. The two recorders were then carefully synchronized and playback levels matched. 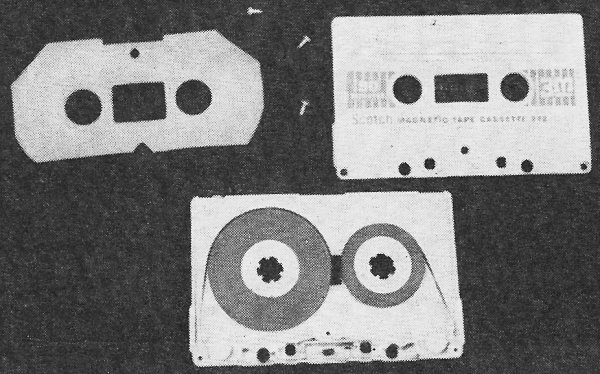 At this point, a half-dozen music enthusiasts were invited to sit in on the demonstration and attempt to determine which was the original tape being played on the conventional recorder and which was the cassette dub. After a dozen runs, the scores of each of the judges were tabulated. The fact that they scored less than 50% accuracy may be viewed as a relative indication of the fidelity of the cassette recorder at a preamp or tape-deck output level. Fig. 2. 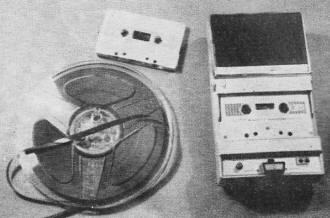 The conventional quarter-track reel-to-reel recorder uses tracks 1 and 3 for a stereo program while the cassette uses tracks 1 and 2. This means that a mono cassette machine is compatible in that it picks up the upper two similar tracks. Fig. 3. The standard playback equalization curve for pre-recorded cassettes (1 7/8 in/s) shows less bass boost and less treble roll-off than is used at higher tape speeds. The characteristics of the curve are the same as would be produced by RC circuits with a time constant of 1590 μs at the low frequencies and 120 μs at the high frequencies. Although the cassette design is relatively trouble-free, there are some problems associated with the cassette recorder. Among these, especially with the less-expensive portable models, are: inconsistent speed, excessive flutter and wow, poor frequency response, noisy recordings, and broken or binding cassettes. Many of these problems can be easily eliminated through the adoption of a good maintenance program. Inconsistent tape speed, intermittent operation, and excessive flutter and wow, may often be traced to low battery voltage. Most portable cassette recorders are equipped with ordinary carbon-zinc batteries which have a usable battery life of approximately 14 hours in this service. After that, the battery voltage is too low to maintain proper tape speed. Also, a number of cassette recorders are damaged by leak-proof carbon-zinc batteries that somehow manage to leak. In order to obtain better battery performance, it is advisable to switch to alkaline activated batteries or, whenever possible, use an a.c. adapter. The a.c. adapter will rejuvenate the alkaline batteries a number of times, provided the batteries are not allowed to discharge below half of their full-charge level. Alkaline batteries cost up to twice as much as the carbon-zinc batteries but the alkaline batteries last up to twice as long and deliver much better performance in the long run. Another battery-saving tip is to stop the cassette recorder as soon as possible after it reaches the end of the reel. Although the cassette recorder has a built-in slip clutch to prevent the drive motor from stalling, the increased load on the motor causes rapid battery drain, particularly if left in this condition for any length of time. Similarly, the use of a good-quality cassette tape can also increase battery life by decreasing the drag on the drive motor. Occasionally, a portable cassette recorder will develop intermittent operation due to poor battery connections. Generally, good electrical contact can be restored by rubbing the battery terminals with a pencil eraser. There are three basic problems encountered in using cassette tapes: bunching of tape near the capstan due to a loose or uneven tape wind, internal binding of the reels due to poor lubrication, and end-of-the-reel leaders which come loose from the reel. To avoid these problems, use a known brand of cassette for those critical recordings. Carefully check the smoothness of the tape wind as seen through the small window on the front of the cassette. If necessary, rewind the tape before using it. If the leader tape should happen to break loose from the end of the reel, simply remove the screws holding the cassette together and reconnect the leader to the reel by means of the special hold-down connector located near the hub of the reel. In order to maintain the cassette's high-frequency response, signal-to-noise ratio, and low percentage of flutter and wow, a good maintenance program similar to that of a conventional reel-to-reel recorder should be employed. 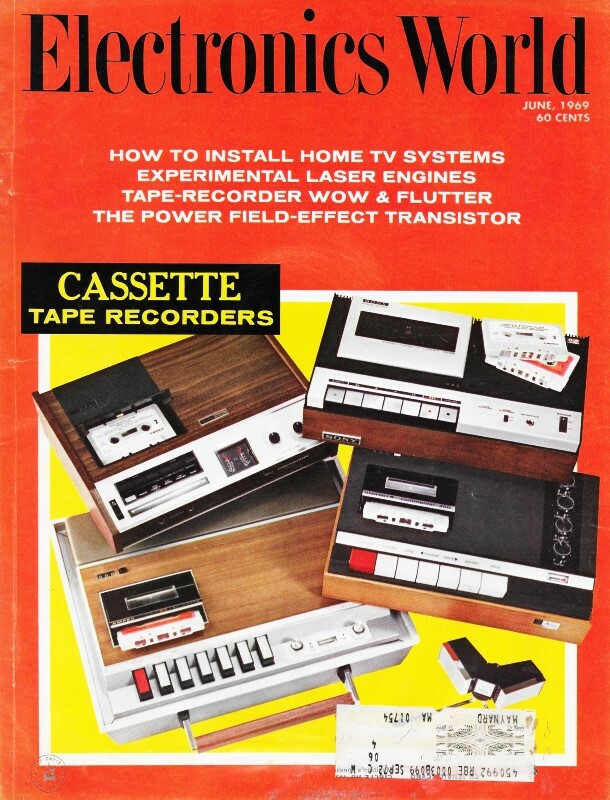 (See "Tape Recorder Maintenance Program" in the October 1968 issue of this magazine.) For example, the heads and transport unit should be cleaned often with a cotton swab and denatured alcohol. In addition, the heads should be demagnetized any time the surface or background noise becomes noticeable. Prior to recording an important conference or speech, it's a good idea to check the battery level, battery connections, and thoroughly clean the unit. In this manner you can be assured of getting your best recording. If head replacement is required, there is a line of replacement cassette heads available equipped with pre-set integral tape guides for correct tracking without the need for elaborate equipment. A mono head lists for approximately $16.00 and the stereo version is available at approximately $22.00. In the first generation of cassette recorders, most makes and models closely resembled the original Norelco "Carry-Corder." However, today, most manufacturers have modified the original design to include such features as push-button control, automatic record-level control circuitry, tone controls, pop-up control for ease in loading and unloading cassettes, hysteresis synchronous drive motors, etc.